Christmas is right around the corner, and everyone at Vintage Tub & Bath has been busy prepping for the holiday season. Whether we’re trimming our tree or designing our 2017 Holiday Gift Guide, we couldn’t be more excited about the upcoming festivities. We’re always looking for ways to make your shopping experience as smooth as possible, especially during the holidays. Below are some of the popular products from our 2017 Holiday Gift Guide that are sure to be a perfect fit for everyone on your Christmas shopping list. 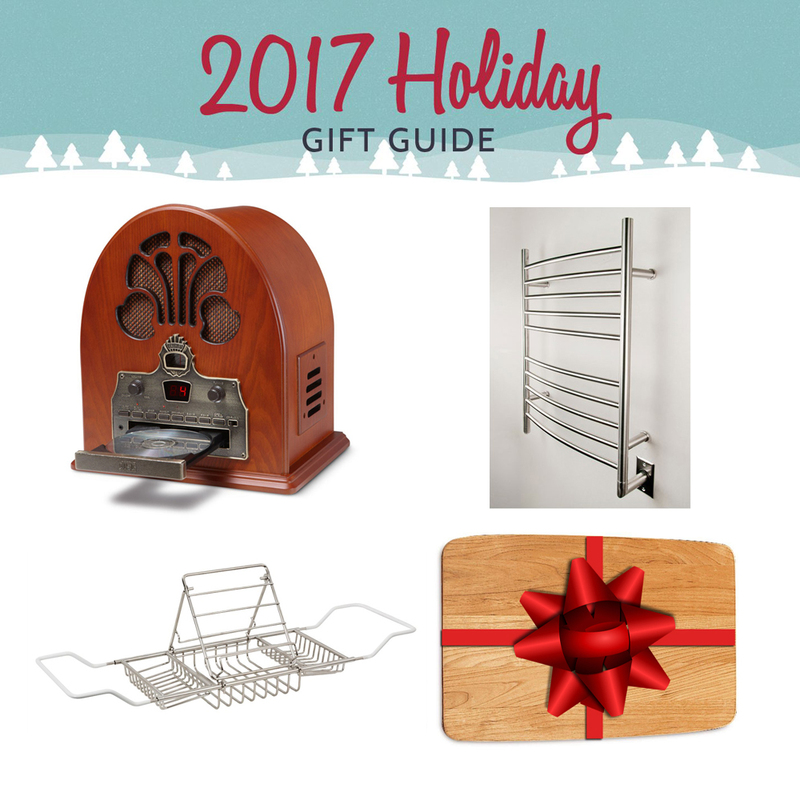 Crosley Vintage Cathedral Style Tabletop Radio with CD Player – The perfect gift for the musicophile on your list. This vintage tabletop radio comes with a CD player, AM/FM radio, analog tuner, external FM antenna, automatic frequency control, adjustable tone control, and a dynamic full range speaker. Amba Radiant 24” Curved Towel Warmer – Give your loved one the gift of warmth with a wall mount Amba Towel Warmer. This Amba model comes with 10 bars, so there’s plenty of room to warm multiple towels at the same time. Home Accessories – Looking for a one of a kind gift? Look no further than our selection of home accessories, which includes candle holders, decorative statues, wall art, and more. With over 50 products to choose from, we guarantee you’ll find something for everyone on your list! Randolph Morris Adjustable Tub Caddy with Reading Rack – Who doesn’t enjoy a relaxing bath? This adjustable tub caddy with a reading rack is the perfect gift for someone who enjoys soaking in a bubble bath after a long, cold day. Blanco Red Alder Wood Cutting Board – A new cutting board is a perfect gift for the person who loves to cook. This Blanco cutting board is made from red alder wood and features durable rubber feet to ensure there’s no slippage when prepping food. These are only a few of the products available in our 2017 Holiday Gift Guide. Make sure you visit VintageTub.com and check out our entire selection of holiday gifts and more!